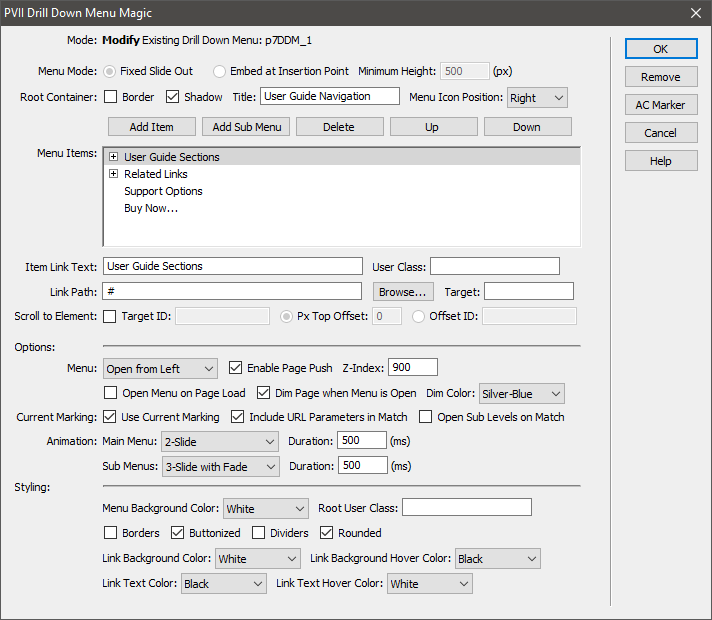 Drill Down Menu Magic The most interesting Dreamweaver menu builder ever! When you create a menu in Fixed Slide Out mode, the menu is triggered by clicking or tapping a hamburger icon. Menus can slide out from either the right or left. The menu in its root state, when the page first loads. After clicking or tapping on "Electronics", a sub-menu (with a descriptive heading) slides into place and a Back Button appears. Choosing "Televisions" causes the menu to drill deeper. You can have an unlimited number of levels! Menus can be set to slide out from the left or right, driven by a Hamburger icon or they can be embedded right in your page... in a sidebar, for example. The Drill Down Menu Magic interface installs into Dreamweaver, giving you the ability to create and manage as many menus as you want. Set styling options to Create your dream menu! Smooth Scroll to same-page links capability built in! The most interesting Dreamweaver menu builder... ever! Measured against other tools, PVII Menu Builders have no equal. PVII tools make Dreamweaver better.